Yesterday’s wide spread down bar confirmed several things simultaneously. 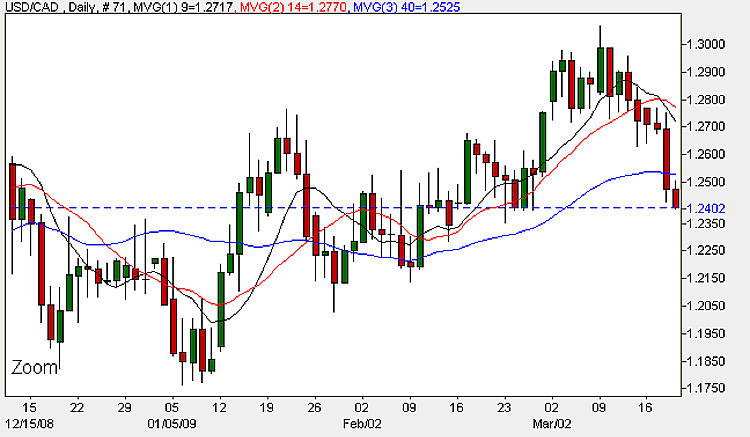 First, the closing price breached the 40 day moving average with all three moving averages now pointing to a move lower. Second, this candle confirmed the strong bearish tone to the usd to cad pair which I have been suggesting for the past 2 weeks, and with yesterday’s move penetrating strong support at 1.2600 we should now see a determined move lower possibly to retest support at 1.21 in the next few days. This may be assisted by the Canadian fundamental news due out later today for core CPI. With a forecast of 0.2% against a previous of -0.4% this measures the change in the price of goods and services purchased by consumers but excludes the 8 most volatile items. The reason it is important is partly because the Bank of Canada pays the most attention to the Core CPI figures and therefore basis any future economic policy (including interest rates) around these numbers so they can have a significant impact on their release. Indeed as I write the figures have just been released at 0.5%. The short and medium term outlook is bearish with the long term sideways. For the latest currency news, fundamental news and the economic calendar for today, live currency charts or for help in finding an ECN broker, just follow the links here.